In late March and early April this year, I spent 3 weeks traveling in Japan with my fellow nanotechnology students from NTNU. Upon personal request from a certain very special Auntie Ladybird, I'm going to do a couple of posts about Japan (because this blog didn't exist then!). In fact, if you ever happen to go to Japan, these posts might contain useful or interesting information, or they might just help you mental prepare yourself for the over-the-top, insane experience that Japan is. Here's a nice Google map of my travel route. You can even click on it and zoom in on it if you want to! 1. Tokyo Tower: This was the only thing I did in Japan that felt like a waste of money (except accidentally giving a taxi driver a 10K yen bill (about 125 USD) and never getting change, but that's an entirely different story). After our first day in Tokyo, we thought it would be cool to go up Tokyo Tower and see the skyscape of Tokyo by night. 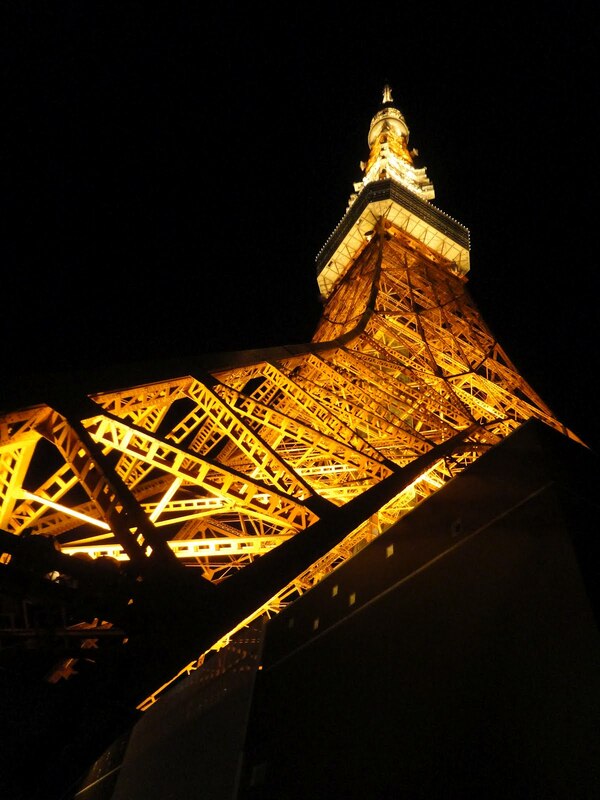 Tokyo Tower is very cool looking, as illustrated by the artsy photo below. a) Tokyo has virtually no interesting landmarks that can be seen from the tower. Paraphrasing the professor who accompanied us on the first week of the trip: "Japanese architecture is like the inside of a factory". b) Tokyo is an endless, homogeneous mass of city that extends forever. Endless city is kind of my nightmare (those who have previously read my blog may have noticed that I generally enjoy being outside in, well, Nature). I also had no interest in waiting 45 minutes in line to go up to the higher observation deck, and consequently left Tokyo Tower rather quickly. Cons: Uninspiring view. Expensive elevator trip. The realization that you are stuck in the world's largest metropolis with no escape! 2. 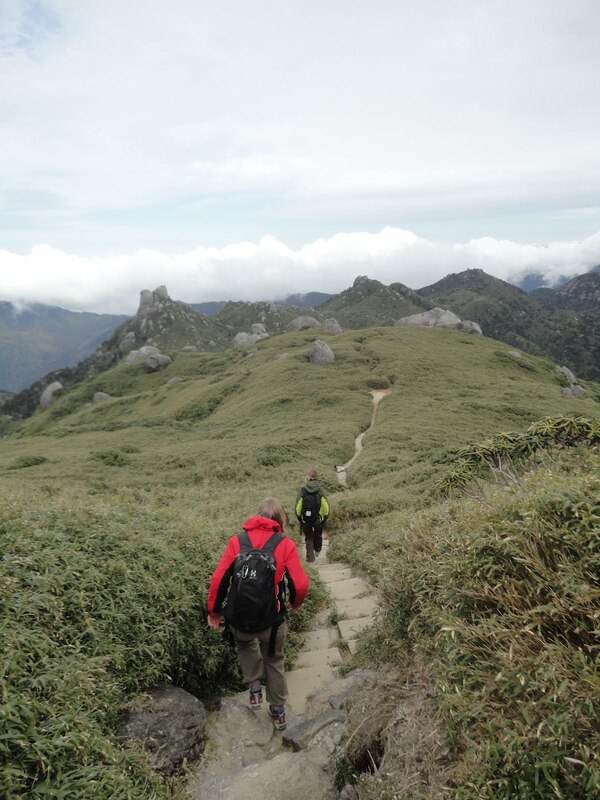 Hiking on the island of Yakushima: The Japanese are not great outdoorsmen, but when they undertake anything, they do so thoroughly. 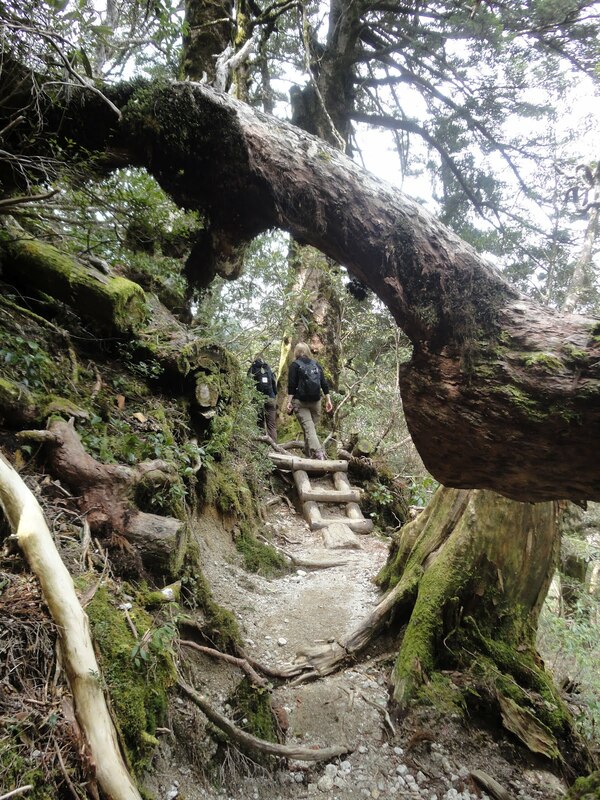 Yakushima is an almost oxymoronic example of this; on this beautiful island, the Japanese have tried tame and organize a wild, untameable jungle. There are signposts every 200 meters telling you exactly where you are; all wet spots on the trail have boardwalks on them and every hill has steps built into it or a rope that you can hold on to while you are climbing. King Kong could live here: a view from the rental car up to the trail head. Strange peak formation and tall grass above the jungle. Astrid in red, Julie further forward in green. Endless ocean: Yakushima is very isolated island, 2 hours from the mainland. This is the view from out campsite the first night. Best. Hot spring. Ever. This natural pool on the coast only costs 100 yen to soak in. But t clothing is completely unacceptable in Onsen (hot springs), and this particular one was unisex. Awkward story shall be skipped. Pros: Beautiful jungle and hiking. Coolest hot springs in Japan. A less visited attraction than the big cities. Cons: Hard to get to. Rains a lot. 3. The old city of Kyoto: Kyoto is quintessential Japan. During WWII when Japan was being bombed like heck, Kyoto was preserved because both sides agreed it was to beautiful to destroy. The feel is completely different - especially in the old, UNESCO World Heritage part of the city. I visited the old part of the city (Gion, etc) twice. Once very, very early in the morning and once during normal tourist hours. The first visit started when I woke up a 6 o'clock in the morning and decide it was an excellent time to go jogging. I knew my room mates would sleep for a couple more hours; I was, after all, training for a marathon. This proved to be an excellent idea. Padding slowly down the streets with only a map and my cell phone, I truly felt Japan. I could almost see a Geisha as I turned a corner; when I climbed the hill to Kiyomizu-dera temple, I felt contemplative and stop to take drink of water from the fountain and look at the city. Isn't that what visiting temples should be like? When I later wandered the same area with my friends, the magic was gone. Tourists crowding the streets, desperately snapping photos of the beginnings of cherry blossom brought me the present. Kyoto is bested experienced quietly. Pros: The beautiful remnants of old Japan are a must-see. Definitely what you except Japan to look like before you get there. Cons: Touristy and busy during the day. Many of the temples and shrines, although very beautiful, are similar, "once you've seen one, you've seen em all".